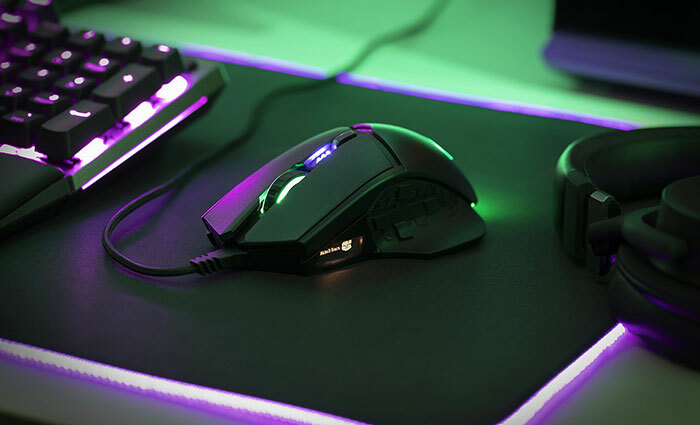 PC peripherals and components specialist Cooler Master has launched a new ergonomic gaming mouse. Key features of the MM830 are its integrated D-Pad, high resolution sensor, OLED display, quad-zone RGB lighting, and purported ruggedness. 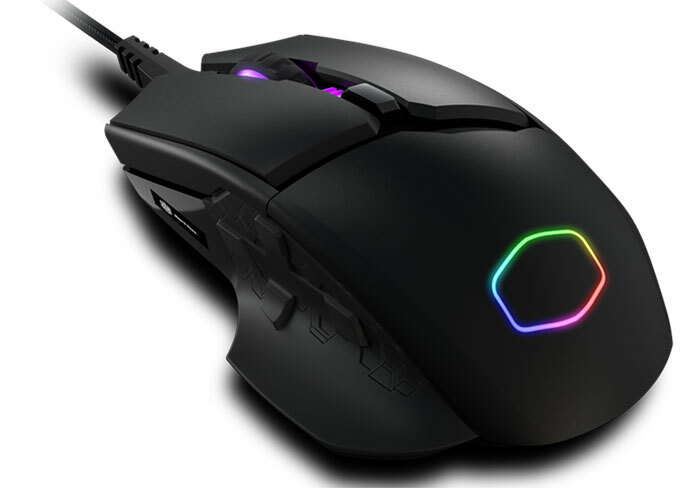 The 8-button Cooler Master MM830 is described as being particularly useful for MMO games in an email and press release sent to HEXUS, but curiously the official product page doesn't mention MMOs at all. Dedicated D-Pad Buttons - Always within reach and out of the way, unleash your Ults or vital abilities with four hidden buttons in the thumb-rest area for unmatched fast access. Quality Construction - PBT chassis minimizes wear and tear due to sweat, sun, and Cheeto dust. Omron switches and Japanese ALPS scroll encoder for nice snappy weapon switches. Expanding on the above, there are 8 programmable buttons in all, with the left/right buttons being backed by Omron switches with 20 million click estimated lifespans. 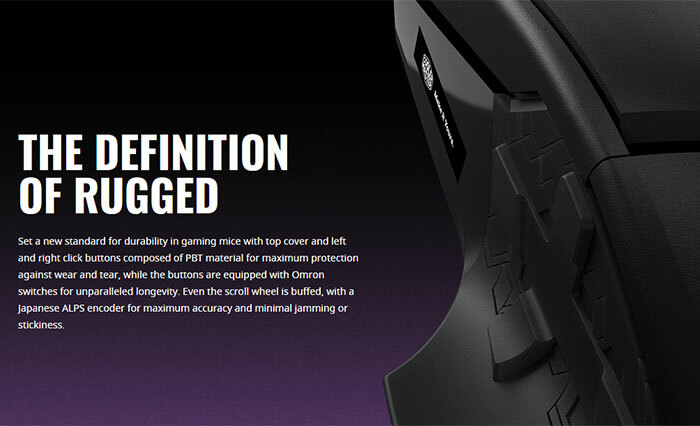 Cooler Master says that the scroll wheel is 'buffed' too, using a Japanese ALPS encoder "for maximum accuracy and minimal jamming or stickiness". Inside the MM830, Cooler Master uses the Pixart 3360 Optical sensor. This component can be 'instantly' adjusted between 4-levels of sensitivity between 100~24,000dpi. Customise these values in the control panel software where you can also tweak plenty of other settings and lighting profiles etc. The chosen sensor provides a tracking speed of 250ips, acceleration of 50g, and an adjustable lift off distance of <2mm. Other performance specs include the 1000Hz /1ms polling rate, with this and other operations supported by the built-in 32-bit ARM processor. Physically we are looking at a 82.2 x 130.1 x 43.4mm rodent constructed largely from PBT plastic / rubber, which weighs 122g (without cable) or 162g if you take into consideration the 1.8m braided cable's weight. Cooler Master has, frivolously, gold plated the USB connector. If the Cooler Master MM830 appeals, then you might be happy to hear that it is already available for pre-order in the UK priced at approx £60. Head over to Scan and you can grab it for a penny less than that, with shipping expected to commence from 18th Feb. Buyers will get a 2-year manufacturer guarantee. Not my thing and with some questionable features… but the price is about right for it, at least. I wasn't interested at all, until I saw the D pad. I don't know why it's taken so long for anyone to do this, it's perfect for optimal use of the thumb. Two buttons is a waste, and 12 is just silly, but 4 is easy to map in your brain. A 24,000 DPI sensor, if a true resolution, is fairly impressive. That's a resolution, if my maths are correct, of a 1000th of a millimetre. I wasn't interested at all, until I saw the D pad. I don't know why it's taken so long for anyone to do this, it's perfect for optimal use of the thumb. This and other features like it have been done before, both on mice and on keypads, but with limited popularity. On mice especially it can be quite awkward to use as an actual D-Pad, as it often conflicts with the mouse movement. Decent price, I might pick one up to replace my steelseries rodent which has issues sometimes.